Save AED 531 (30.69%) – Earn 114 Shukrans What is Shukran? Shukran is the Landmark Group’s award-winning loyalty programme in the Middle East, which allows you to earn Shukrans when you shop any of our brands. 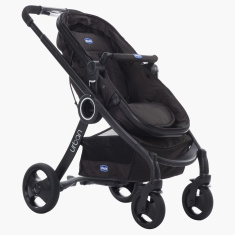 Take your baby out in this stylish and convenient stroller. Sturdy and highly functional, this stroller lends maximum comfort and support to your little one during the ride. It is completely foldable which makes it easy to be carried and stored when not in use.